Located in one of the U.S. Top Cities, 6004 Manchester Circle is a 4 bedroom 3.5 bath custom designed Townhome built in 2006. It sits in a quiet gated enclave just 3 miles from Downtown Roswell on Canton Street and walking distance to local shopping (Publix, Target), restaurants (Sushi, Taco Mac) and entertainment (Movie Tavern). The unique open floor plan on the main level includes a high end kitchen with solid granite counters, a sleek black appliance package and wood cabinetry. The living room features a fireplace, soaring 9ft+ ceilings and gleaming hardwood floors throughout the common areas. Upstairs you'll find a master suite with private master bath, large walk-in closet and plush wall-to-wall carpet. Sparkling improvements have been made such as repainting the interior and adding the granite tops in all 3 bathrooms. Take a leisurely stroll through the community walking trails, dog park and arrive at the pond exclusive to Manchester Place residents. Built in 2006, the open floor plan was a custom designed by the original owner who worked directly with the builder. The 9ft ceiling give the space a grand, open feel. Through the years many have dreamed of living in this part of town only to be frustrated with the older designs. Here, the 3 key rooms - the kitchen, the living room, and the dining room - totally work. It is worth the trip just to see the space. High end features such as crown molding, open air entertainment deck and hardwood floors make this unit feel contemporary and comfortable at the same time. The open kitchen itself is not only appealing to the eye--it will be appreciated by those of you who enjoy cooking. The palette of the wood floors matches perfectly with the grain in the wood cabinets. "Yes" there are gleaming granite counters, but do you know why chefs love this organic surface in the kitchen? They are very durable, elegant and you can use them to chop ingredients, cut fresh flowers or roll out dough for pizza or cookies. A minor but important footnote about the current owners is this: the home sparkles. Ladies and gentlemen, you could film a "Mr. Clean" commercial here. Do you have parents that will make extended visits? If so, the split-bedroom design affords maximum privacy for all. And there's a full finished basement bedroom with a full bath so your guests can have their own space when they visit. The master suite and 2 additional bedrooms are upstairs. And storage won’t be a problem here — there’s closet space to spare. Dear reader, slow down for just a moment and think about the uses you can derive from the setting here. If you have one of those bone-crushing, stress-packed weeks at the office you can begin the de-stressing when you get home on Friday. It all starts with two buttons--first is the one that turns off your cell phone, then the one that turns on you favorite music. Open the back door and windows--sit outside on the open air deck with a glass of wine and practice meditative breathing. Later you can make a healthy dinner. Sleep in Saturday morning and have lunch al fresco on the deck. Feed the birds. Read a book. Take a nap. There's a walking trail for exercise, and if a dog is part of your family, he will have an open space to roam, and the scent trails left by all the various critters that live in the woods will be his dog nip--he will be in heaven. What are you waiting for? 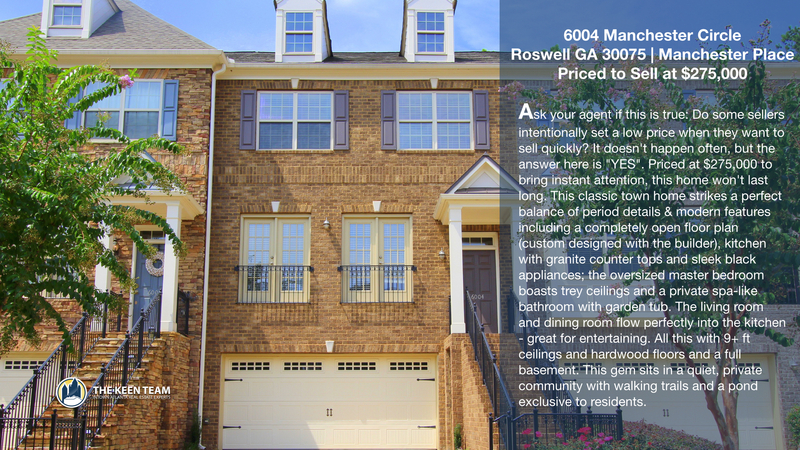 Here is a modern, 3-story townhome with a 2-car garage, excellent layout of rooms, impressive quality, convenient Roswell location, and the nature setting is not likely anything you'd expect at this price. Many of the furnishings are negotiable too. 6004 Manchester is unique among it's competitors. The open floor plan was custom designed from the ground up directly with the builder. You could not get a better design for your long-term use. The friendly price is well under what you'd pay for newly built, similar square footage. If you're a ready-to-act buyer, get to this home right away. Because prices in Roswell are up the last 28 months in a row. Dear reader, here is your chance to own a home you can grow into. The floor plan is expansive, there are many extras, and the location is close-in. And the seller has established a very tempting price. Call today for availability and to arrange a private showing. For the most up to date listing price or to arrange a no-hassle, private showing feel comfortable calling or text message Joshua at 404.538.5356 today. He's happy to help answer any of your questions about the home and help you discover why this is the home you've been waiting for. Serious inquiries only.